Note: This is an historical page and was believed to be correct and current until April 2013. The business is no longer operating and therefore this page is no longer being updated. The website remains for historical portfolio purposes and for information and interest. 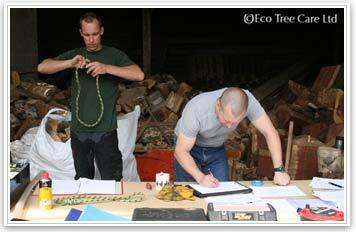 The following are Eco Tree Care and Conservatrion Ltd notes on LOLER inspections for tree surgery equipment. These are provided for interest and information only. We do not provide independant LOLER inspections ourselves. LOLER stands for “Lifting Operations and Lifting Equipment Regulations”. These regulations came into force on 5 December 1998. The MHSWR require a risk assessment to be carried out to identify the nature and level of the risks associated with a lifting operation. 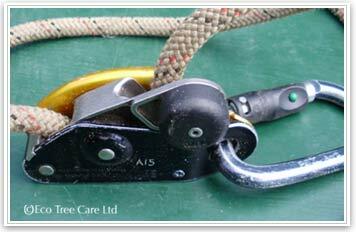 Tree Surgery 'Climbing' Equipment must, by law, be subjected to a through independant examination every 6 months. This covers all equipment that is involved where people are being lifted or are using it to climb. For lifting gear used in tree surgery operations, such as lowering equipment and rigging equipment this is subject, legally, to a 12 month independant LOLER inspection. There is also a requirement to have the equipment checked for safety if there is an 'exceptional circumstance' which may have compromised the safety of the equipment. A competent person is someone who can show they have the 'appropriate theoretical knowledge and experience to enable them to detect defects and weaknesses in the equipment'. This is recognised as someone who has attended a recognised course and achieved certification for LOLER inspection. This should be someone specifically trained to inspect arboricultural equipment and who has a working knowledge of the tree surgery industry and tree climbing. They must also be totally independant and able to act with out "fear or favour". Tree surgery equipment is expensive and so condeming it, by taking it out of action because it is potentially unsafe, can be quite a financial hit to the owner. Therefore there is the potential for a conflict of interests. LOLER requires accurate records to be kept itemising each and every component and identifying it with a unique mark. The LOLER inspector will issue a written record of each item checked and anything removed from service. 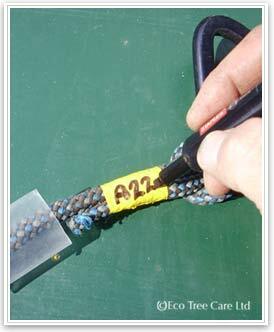 Use heatshrink to seal the marked numbers. 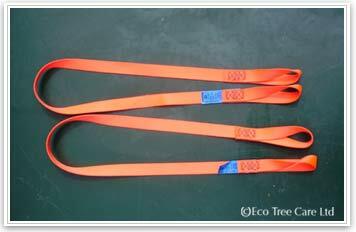 There are systems on the market for tree surgery companies with a large inventory of equipment that employ bar codes or electronic tags. This allows equipment to be quickly identified and the record updated electronically in one go. As well as the half yearly independant LOLER check there is legal requirement to have a weekly in-house check of the arb climbing and lowering equipment. This must be properly recorded and again must be done with the mind set of "without fear or favour". 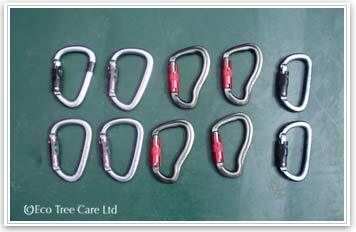 It is usual and recommended, some would say essential, that each climber has a dedicated climbing kit that they look after and they inspect for themselves. The in-house checks should be carried out by persons holding tree surgey climbing qualification NPTC CS38 - Climb Trees and Perform Aerial Rescue. 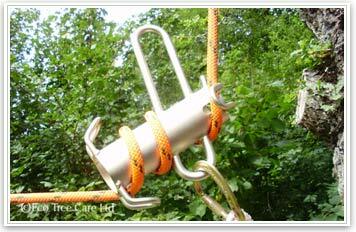 The thorough inspection of arb climbing equipment to LOLER standards is part of the training and assessment. On top of all these formal and written inspections the climber should always give their equipment a once over before they start climbing, maintain awareness of it during the working day, and inspect it again as they are putting it away. It is basic common sense and with practice becomes quick and second nature. 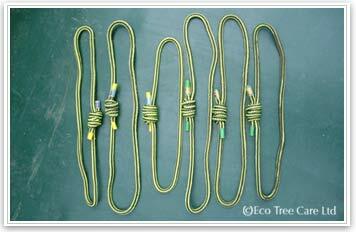 As a general rule it is said that fabric tree surgery equipment (ropes, harnesses, strops e.t.c.) are ten times over-engineered i.e. They should be able to withstand loading of x 10 the stated rating. Metal items (e.g. karabiners, maillons, grillons) are said to be five times over engineered. This is not something to be used in LOLER calculations or in assessment of risk as it is a very general and unqualified statement. However it is included here for interest and it also serves to give a broader understanding what may be classed as an ‘exceptional circumstance’ e.g. in the case of a severe shock load. 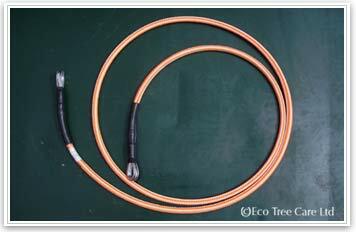 There are general guidelines on the age of tree surgery equipment in service. 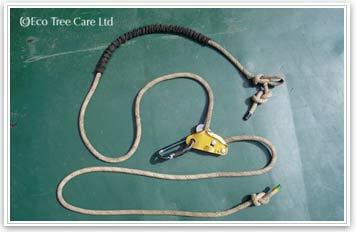 However the LOLER inspectors role is to ensure that equipment is safe to use for its intended purpose, therefore if a harness or a rope is in good condition having seen little use then discretion can allow for it to remain in service longer than the guidelines. Old equipment can be kept in service by good maintenance and repair practices. It is quite acceptable to clean and lubricate a sticking karabiner lock so it is working consitently. 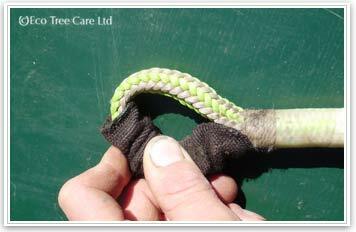 Ropes can by shortened and re-sealed to cut out damaged sections (unless the damage is due to overloading). 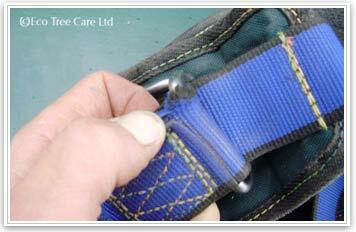 Likewise a harness can be returned to the manufacturers for re-stitching or repair. 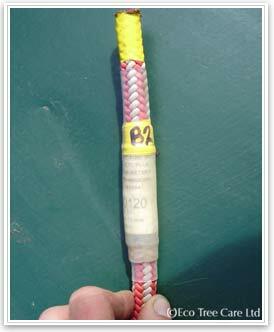 Climbing ropes must be uniquely identifiable – Our preference is to use coloured tape wrapped at one end with a unique identifier number. The Tape and rope is then sealed with clear heat-shrink and a heat gun. 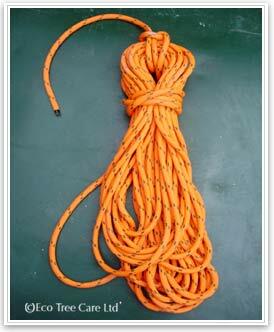 Keep all climbing ropes from coming into contact with petrochemicals and solvents. 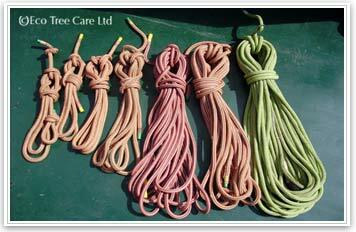 Ropes should be kept clean, preferably kept in a dedicated rope bag. 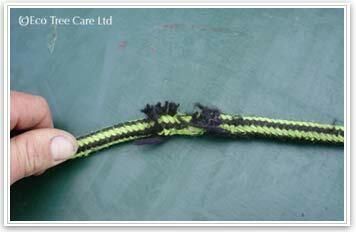 Ropes can be cut to remove the damaged section, resulting in shorter ropes. Ropes should be cut and the ends sealed with a hot knife. 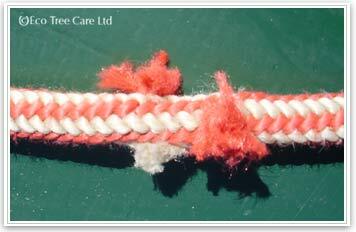 If the rope has a sewn eye at the end then this must be inspected carefully. If the eye has a protective sleeve then this must be pushed or pulled out of the way to enable the entire loop to be inspected thoroughly. Eyes should only be sewn by professional rope manufacturers. Check all the stitching on load bearing points. 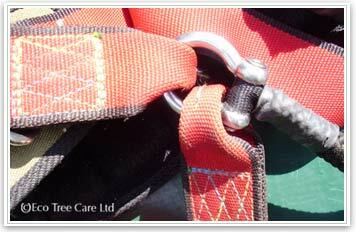 The photo above right shows a climbing harness that has an area of concern. However it is just minor fraying. It is fine it just needs tidying up by cutting off the fray and using a lighter to gentle seal the fibres. Record any actions taken. Fail if any damage is over 10% of the width. Check the sliding D ring if present. 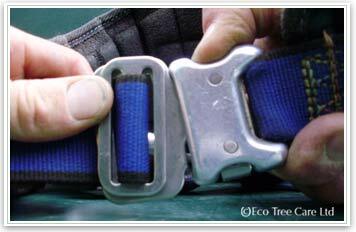 Check the clips that do up the harness waist belt and the leg loops. Ensure that they only open when both buttons are depressed. Try depressing one only in turn to test the clips. Harnesses must be individually numbered and identifiable. Lifetime of harnesses is typically 5 years as other fabric items. 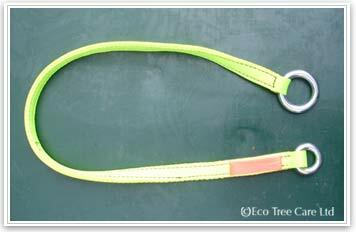 The lanyard rope can be bought separately and can be replaced when necessary e.g. Beale – Antipodes. 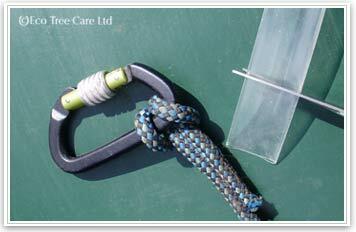 If a length of suitable rope is used then a fishermans knot can be used to tie it to the karabiner. 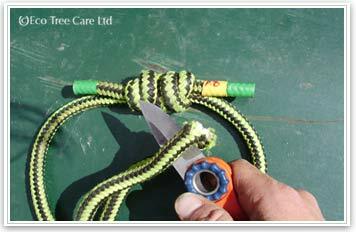 A stopper knot must be tied in the end. The metal Grillon has a life time of 3 years, the rope is subject to the same checks ands specification as climbing ropes. Cambium Savers are part of the climbing system and must be submitted to the same rigourous inspection. Rope for prussik loops must be ‘friction rope’. 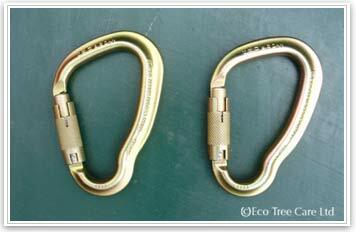 Rock climbing rope is not suitable as it is not heat resistant. When tying use a double fishermans knot.The tail need to be twice the size of the rope. Do not tape up the tails. The outer sheath is for friction and should be intact. If the outer is still useable then it is still ok. Check that the ends of the sheath are intact and not coming away. Run fingers all over the metal to feel for any nicks or sharp bits. Smooth of any with ‘wet & dry’ paper. Sharp bits could damage climbing ropes or harness. 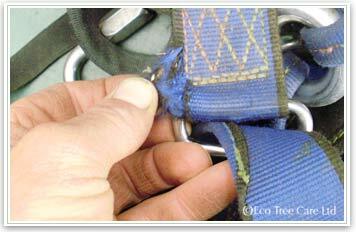 Do not put karabiners straight onto sliding harness strops, use a maillon in between. Grit on the sliding strop can wear away at the karabiner. The karabiner can be engraved on the spine or on the barrel with an engraving tool and should be uniquely identified. 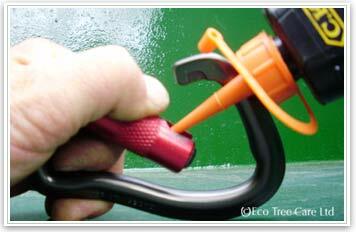 Two way karabiners can be used for attaching chainsaw to strop and chainsaw strop to harness. Saw strops should not be home made as there are items specifically made for the purpose. Professionally made saw strops will have a stitching that will intentionally fail in case of an emergency e.g. if the saw is taken by a branch out of the tree whilst back cutting. 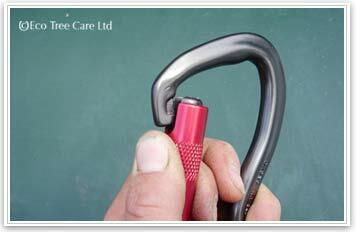 Climbing equipment should be subjected to a weekly in-house LOLER inspection. There must be a written record kept of these inspections. For aerial rescue purposes there should always be a 2nd climbing kit on site. It has been suggested that this should be an actively used climbing kit rather than one reserved specially for aerial rescue. In the case of emergency the person performing the aerial rescue will be much more effective if the equipment used is familiar and used regularly. 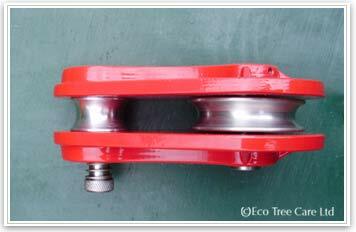 Pulleys in the rigging kit should only be used for setting up 3-way pulls e.t.c. Check that there are no sharp edges. Ensure that the locking mechnism is smooth and closes correctly. Lowering ropes should be low stretch with high strength. Rigging equipment should be visually inspected prior to each and every use. Rigging equipment should be subjected to a monthly in-house LOLER inspection. There must be a written record kept of these inspections. Rigging equipment should undergo a LOLER inspection by a independent and qualified LOLER inspector every 12 months. Ensure that equipment that has failed is permanently taken out of action i.e. cut prussik loops, strops e.t.c. This document is to serve as information and guidance only and may be subject to updating & changes. It may contain errors and omissions. 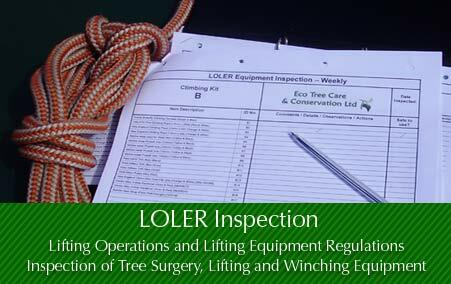 DO NOT base LOLER inspections or tree surgery equipment inspections solely on these notes. Instead contact a qualified LOLER tree surgery equipment inspector for definitive answers and have you arboricultural equipment inspected by them. Consult the HSE documentation and legislation and contact them as necessary. You alone are responsible for the safety of your tree surgery equipment.